Are you crazy about your horse(s)? Do you enjoy wearing fashion-forward products that express the love you feel for your furry kids? If you answered yes, you'll love our brand-new line of Silicone Conversation Bandz™! 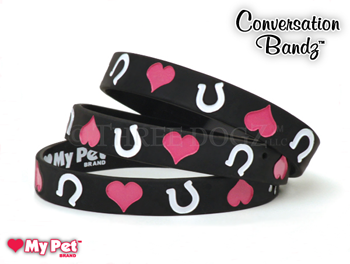 Our adorable “Love the Hoof™” print bracelet design needs no explanation. If you “Love the Hoof™”-- you already get it!